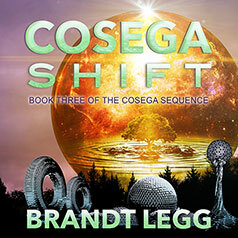 Cosega Shift, the thrilling conclusion of the Cosega Sequence trilogy, begins with an unexpected twist that forces Gaines to question, who is the real enemy? Cosega Shift, the thrilling conclusion of the Cosega Sequence trilogy, begins with an unexpected twist that forces Gaines to question, who is the real enemy? Close to cracking the meaning of the Cosega Sequence, he has gone beyond proving that modern humans did not create Earth's first technologically advanced civilization. The Eysen has revealed secrets that exceed the most fantastical imaginings, but the combination of knowledge and destiny is dangerous. As the world's strongest powers move in on him, Gaines learns that his enemies are nearer than his friends. They will do anything to obtain the Eysen and silence him. With time running out, the lost Clastier Papers may hold the key. Who were the Cosegans? What did they want us to see? And what did they need us to know?